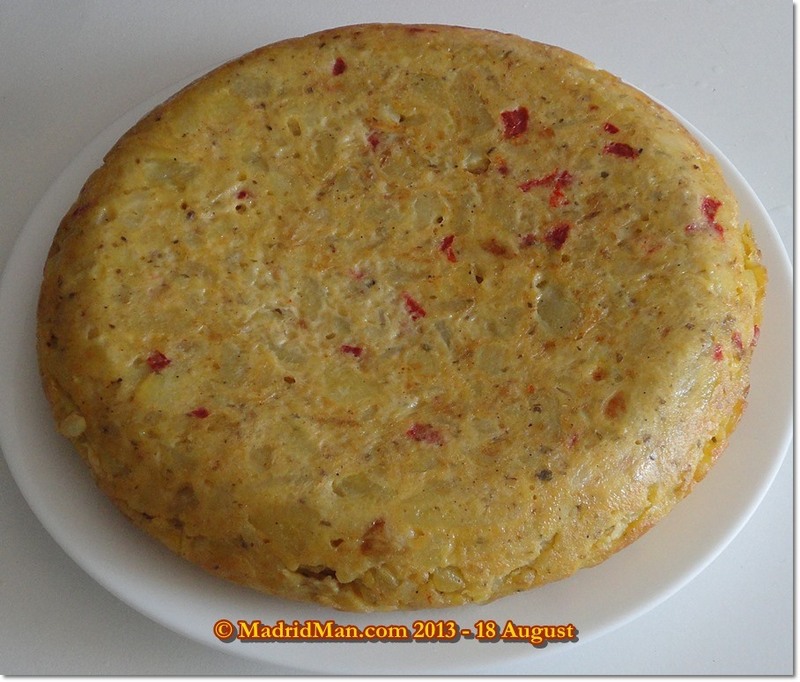 I started making the famed “tortilla de patatas” a few years ago and it definitely is a practice-makes-perfect journey. The first effort was a disaster, the potatoes were overcooked and brown, too salty, and I burned my plate-hand with the hot oil when I turned it. Plus, it took more than an hour to make. The second was less, but still brown and bland for lack of salt. Happily, the third and (nearly) all subsequent tortilla de patatas were edible and quite attractive and took roughly 45 minutes from start to finish. This entry was posted in About Spain, Food and tagged best, cebolla, cook, cooking, eggs, food, fotos, home made, huevo, patatas, photos, potato omelette, potatoes, receta, recetas españolas, recipe, sal, salt, Spanish, spanish cook, Spanish cooking, spanish food, Spanish omelette, Spanish recipe, Spanish tortilla, tortilla, tortilla de patatas, tortilla española, traditional, Video. Bookmark the permalink. Looks great! I´ve never eaten tortilla with red pepper but next time I´ll make it. By the way I have laughed to myself with “4 large eggs or 3 if you´re cutting back” very good. Glad you liked it, jazz! I think it simply adds color more than it adds flavor, but a little of the latter, too. By the way, La Tienda sells a special pan for tortillas that clasp together and make it easier to flip. Like you, MadridMan, I just use a plate. The only time I ever “goofed” was when I was helping my son make it for Spanish class. It ended up all over the floor and we had to start over. Generally, though, I’m pretty good and don’t get burned. As long as you have ‘enough’ olive oil to cook your potatoes through-and-through, that’s okay. The potatoes may brown if you don’t add enough olive oil – and that, you don’t want. I’ve always been told to flip it three times. It’s more important to flip it more often and cook less time on each side so that it gets thoroughly cooked to the middle and, also, avoid the browning of the tortilla. ALL Spaniards recycle their olive oil. Many people have a contained for recycled oiled used for frying eggs and potatoes and (sometimes) another for frying fish. I only recycle the oil used when frying potatoes, eggs, croquetas because it’s still perfectly usable and tastes even better the second/third time around. We used store-bought containers with a thumb-flip lid and a metal sift/filter which separates the solids from the oils. You toss out the solids, of course, and have the oil leftover in the bottom of the container for your next use. Sounds so good! Our variation includes a clove of garlic added when the onion is lost done. I have developed a ‘flip’ technique that I am sure is not authentic, but works for me. After putting the plate on top of the frying pan, I take a terry cloth kitchen towel that is folded lengthwise (usually two folds). The towel spans the plate and allows me use my thumbs on the plate side and my fingers are protected on the hot pan. Then I just align the handle and with one motion turn towards me. I do it over the sink, as MM suggests, but it has not failed me yet. Thanks, MM for you detailed recipe! Elaine, GREAT idea about the terry cloth! You’ll protect your fingers that way from getting hot oil burns. One could also use a yellow, absorbent kitchen cloth – which would be easily cleaned, too. Only thing with using cloths on the plate is that it may make the plate-hand contact much more slippery – depending on the cloth. Congratulations, elaine! 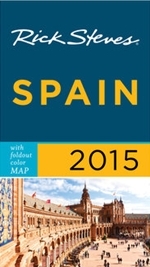 It sounds like you’re following the standard Spanish-method, just like me. 🙂 May you enjoy MANY tortillas de patatas in the future!! I once added garlic to my tortilla and was politely criticised for doing it. “One doesn’t add garlic to a tortilla de patatas!“. But if you do add garlic, add it just before the onion is done as the garlic browns much much faster than the onion. Will absolutely try it with red peppers next time. Several years ago in Barcelona, I was out on a jet lag induced walk very early in the morning. The only bar open was in the square behind the Picasso Museum. I sat and watched the cook make a half dozen or so tortillas. Mine were never that good up until then. I realized what the difference was. 1-He was using the deep fryer turned way down to cook the potatoes and 2-He was adding the potatoes to the eggs when they were very warm . By adding the potatoes very warm you get a head start on cooking the center. Ever since, mine have been perfect. That and I use two pans to flip with! Hey, great recipe. I am glad to visit your site again. 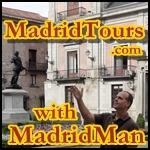 It was a great resource of info when I was living in Madrid years ago. Thanks, Peter! Hope you get back to Madrid someday soon.